Federal immigration agents were filmed arresting a man working inside an Oregon home, even though the self-described agents admitted they didn’t have a warrant to be inside the house. George Cardenas and Carlos Bolanos were hired to remodel a home when two men and a woman claiming to be U.S. Immigration and Customs Enforcement knocked on the door. Cardenas opened the door to inquire who it was, then Cardenas claims he went back inside without inviting them in. Nevertheless, the three of them stepped inside anyway and claimed they were there to arrest Carlos Bolanos for being in the country illegally. At that point, Cardenas pulled out his cell phone and started filming the agents inside the house. When asked to identify themselves, the self-proclaimed agents refused to give their names. Cardenas said the homeowner was on the way back and told the agents they were trespassing by entering the house without the owner’s permission. After seven minutes, the agents surrounded Bolanos while he is talking on a cellphone. They took the phone from one hand and a paintbrush from another as an agent warns him not to resist. Cardenas said Bolanos has four children in Oregon, and that they’re all US citizens. Nevertheless, the agents pulled him out of the house. U.S. Senators Ron Wyden and Jeffrey Merkley said that the incident was “deeply troubling” and that they were inquiring with ICE about exactly what happened. Bolanos was set free after Cardenas’s video went viral. “I think the outcome would have definitely been different if I didn’t record (the incident) or if I wasn’t a U.S. citizen,” Cardenas said. 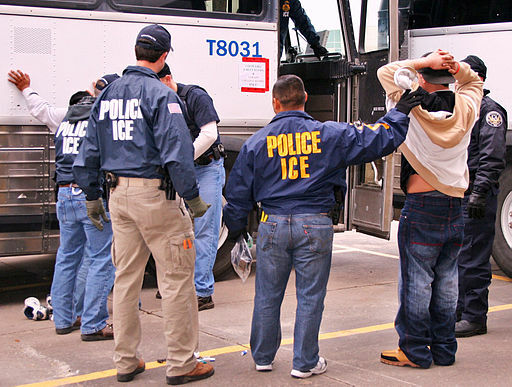 While ICE has legal authority to make arrests, they cannot ignore Fourth and Fifth Amendment protections while doing so. These amendments are not merely red tape. The Fourth Amendment keeps the federal government out of people’s homes unless the government has a warrant. This protection applies to all homes, regardless of the immigration status of the people inside. The Fifth Amendment requires that all persons be given due process before any kind of government action can be taken against that person. These protections are especially important in deportation proceedings, otherwise the government can deport whoever they accuse of being here illegally, regardless of whether ICE is telling the truth or not. In the video, the agents argued that they didn’t need a warrant because the house was a “business” and therefore the Fourth Amendment shouldn’t apply. The agents were absolutely wrong. The warrant requirement applies to commercial buildings. It didn’t matter if the house was being used for business or for residence, the agents either needed the homeowners consent or a warrant signed by a judge. There was also a dispute as to whether Cardenas invited them inside. Law enforcement do not need a warrant if they have consent to enter. Cardenas might not be the owner, but his permission would likely suffice. The parties disagree as to whether leaving the door open means Cardenas gives his consent. Even if leaving the door open is a non-verbal method of communicating consent though, it’s quite obvious from the video that Cardenas did not intend to. Even if he did, Cardenas later revoked his consent, as he demanded the agents wait outside until the owner arrived. One of the most troubling aspects of this story is that ICE agents are making arrests without properly identifying themselves. The agents were out of uniform, refused to give their names, and the only thing identifying them as agents was a keychain around one of the “agents” necks. This is extremely dangerous; if agents do not identify themselves, then anyone can claim to be an ICE agent. If purported ICE agents refuse to reveal their legal authority other than their word, they should subject to all criminal laws that citizens are usually subject to. If the men and woman were not federal agents or acted outside their authority as federal agents, then they should be charged with kidnapping under state law.